Advent | live. laugh. love. 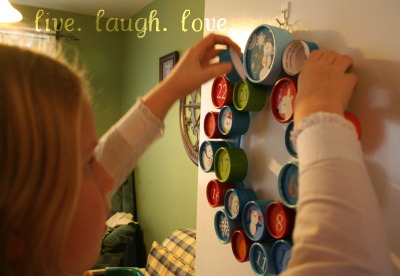 For several years now I’ve wanted to do an Advent Calendar with my kids. The problem was, I never remembered until maybe the last day of November or a couple of days into December. Sure, I could have started it a little later but I tended to just shrug my shoulders and plan to do it the next year. 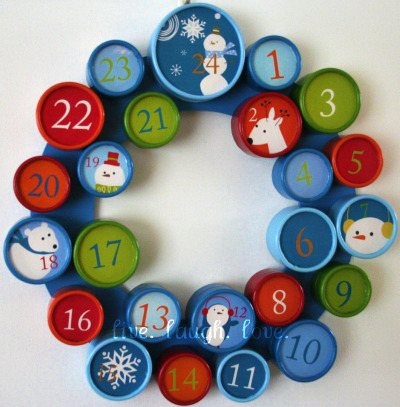 Last year, I saw a neat Advent Calendar/Wreath at Target that I really liked. Unfortunately the only one that was left at my Target was missing a piece. And frankly, I wasn’t interested in driving all over Nashville to various Targets to see if they had one that was whole. So once again, I shelved the idea. Then much to my delight, while we were with my parents for Christmas, I came across one at a Target in their city AND it had all it’s parts AND it was on clearance! So I snatched it up, brought it home and put it away with the Christmas decorations. I spent a good part of the day taking down and putting away my Autumn and Thanksgiving items and pulling out and setting up my Christmas items. And there was the Calendar/Wreath, taunting me. I was so unprepared. It was the day before December. We had just returned on Sunday from being out of town for 10 days. I had so much to do. But I just couldn’t put off for another year, not when I had the calendar right there in front of me. Which is why I was up until midnight last night coming up with our advent activities and setting up the calendar/wreath. And because I couldn’t come up with 24 specific things to do and because I know how, um, well, lazy, I can be, I fudged it a bit and there are three candy days. That means when they open that day, there will be two pieces of candy waiting for them instead of an activity. There are also two present days. They will be told to go look in a certain place to see what’s there. Build a fort from blankets & pillows. Read a Christmas book in the fort. Have hot chocolate with lots of marshmallows or whipped cream. Some of these I came up with on my own, several of them I “borrowed” from Kristen of We are THAT Family. A few others I found on the web (this is a neat list). Do you do an Advent Calendar? What is in yours? Another excellent idea is The Twelve Days of Christmas. My friend, Sarah, is doing this for one of her blog readers (her sweet husband does this for her every year.) I’m going to do this, too…next year. Sorry to make you wait but after putting that Advent Calendar together, I’m plumb out of ideas. So cute! I love the photo and the wreath design. Sounds great! I am actually in the process of making one – waiting for 1 last thing from Etsy. Luckily my kids are young enough to not realize mom is a couple of days behind. Next year it will be ready to start on time. I hadn’t thought of activities rather than little gifts…great idea. I think I will incorporate that too! I love your Advent calendar story and your honesty! 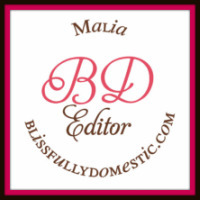 I am bookmarking your blog so that I can read more. I popped over after receiving the Blissfully Domestic e-mail today. We were given a beautiful Advent calendar years ago when my first child was a baby. It was purchased in Williamsburg by a dear friend. It contains 24 small board books which tell the story of Christmas from scripture in small parts each night, ending with the birth of Jesus. These small board books are quite colorful with 2-3 pages each and pictures. They range in size from 1″ – 3″ and each has a gold cord hanger. Once each book is read, it is hung on our den Christmas tree as a reminder of what this season really means. It is one of the more special treasures to me, especially now… the person who gave the gift has recently been diagnosed with a very aggressive, inoperable type cancer. We are praying for a miracle, but are thankful that she has known and served the Lord for many years. Pingback: And the last box has been opened… « live. laugh. love. The 12-days of Christmas are actually the 12-days following Christmas leading up to the Epiphany on January 6th.